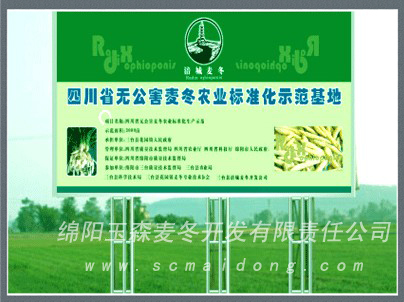 This is a company approved by national related department approves registered enterprise, is located in sichuan province SanTaiXian (ancients calledmianyang state) were known as "the dwarf lilyturf" hometown of, is the national famous "state dwarf lilyturf", "Fu city dwarf lilyturf" production base, the traffic is very convenient, base adopts "company + peasant household" development mode, go scale development, gandour, small profits and quick turnover road, at the same time and sichuan nongda scientific research institutions, such as scientific research cooperation agreement reached, integrating dwarf lilyturf planting study, develop development, promotion, marketing processing, breeding multi-channel trade to a body, guarantee the produce of radix ophiopogonis are excellent in quality, pollution-free, accord with the GAP of the authentication of quality products, base radix ophiopogonis as many as 5,000 mu planting area, annual output of over 2000 tons high-quality dwarf lilyturf medicinal materials, Dwarf lilyturf medicinal seedlings seedlings 80 million, High quality landscaping MaiDongCao 3000 tons. Companies with good credit, the fine service, by the good faith seeks the development, to the quality of survival, and throughout the country landscape construction enterprise, herbal medicine pharmaceutical enterprise, Chinese traditional medicine yinpian enterprise, Chinese traditional medicine chain enterprises, cultivation of TCM cultivating, panax economic organizations, garden nursery base established long-term cooperative relations, warmly welcome all the friends come to visit, investigate base, negotiate the business. Your satisfaction is our pursuit of the goal, your success is our biggest delighted! Company main products: landscaping MaiDongCao; Sichuan dwarf lilyturf medicinal materials; Sichuan dwarf lilyturf medicinal seedlings, Dwarf lilyturf medicinal products processing, act as purchasing agency sell, MaiMenDong; Fine leaf MaiDongCao; Fine leaf along the rank grass; Dwarf lilyturf shoot; and Fine leaf dwarf lilyturf .